If you or someone you care for has diabetes, then you need to read this blog post, Nrf2 And Diabetes: What Your Doctor Won’t Tell You. There is a relatively new area of research that is changing the way researchers look at aging and age-related diseases. This is the study of Nrf2 activation and it’s currently the hottest area of research. Nrf2 is a protein messenger within the cellular protective pathway of each cell that acts as a master regulator of the cellular adaptive response to oxidative stress. The Nrf2 protein acts like a thermostat within the cell regulating “survival” genes within every cell of the body to turn off or on depending on whether the cellular trigger is due to the level oxidative stress, internal and external stress factors, or cellular toxicity. Your body does a great job using Nrf2 regulation to keep your body’s antioxidant, anti-fibrosis (scarring), anti-inflammatory enzyme production optimized while you are young. 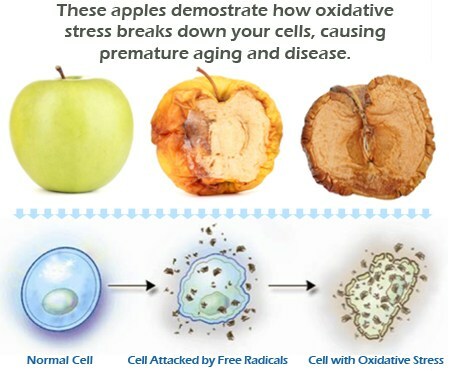 After around the age of 20 years old (for humans) cellular enzyme production, which is regulated by Nrf2, gets slowly turned off, creating an accumulated increase in oxidative stress, cellular stress, cellular toxicity and inflammation as you age. 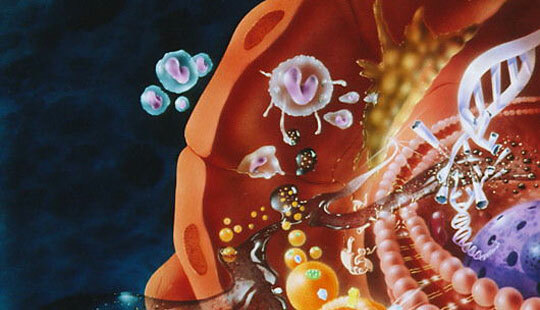 This weakened, toxic state of cells allows disease to set in. So you don’t die from old age, you die from an age-related disease caused by oxidative stress, inflammation and/or fibrosis (internal scarring). In simple terms, your cells are kept healthy and regulated through the Nrf2 pathway while you are young, just like piano keys hold their pitch. Over time, the piano keys go out of tune, as do your survival gene enzyme production through Nrf2 regulation. As you age, Nrf2 activation through external sources, is required to get your enzyme production back to normal in order to keep your cells healthy. Why Is Nrf2 Activation Important? Researchers have known that the key underlying causes of all age-related diseases can be tied to oxidative stress, inflammation and internal scarring. Once researchers learned that Nrf2 activation targeted the underlying problems associated with the disease process of over 200 age-related diseases, these disease-specific researchers became very interested to learn what Nrf2 activation would do for specific disease processes being studied. Accessibility of information and advances in research make it necessary for patients and loved ones to be educated on topics concerning their health, disease processes and peer-reviewed studies that provide information to patients that may improve their quality of health. Doctors don’t intentionally withhold information from their patients when information from peer-reviewed research may prove helpful in their patient’s disease process. The problem is that doctors just don’t know about medical breakthroughs and options for their patients unless the information is coming from pharmaceutical drug representatives or as a result of their continue professional education to maintain their license. There are over 365 peer-reviewed studies on Nrf2 activation applied to diabetes and diabetes complications published by the US National Library of Medicine and National Institutes of Health, on their repository, www.pubmed.gov (2). All research studies and papers published on www.pubmed.gov have been highly scrutinized and have passed a stringent review and re-testing process by scientific peers. The American Diabetes Association highlights over 90 of these studies on Nrf2 and diabetes and diabetic complications on their website (3). These articles and studies discuss Nrf2 activation and diabetic complications like Diabetic Wound Healing, Diabetic Nephropathy, Diabetic Kidney Disease, Diabetic Cardiomyopathy Prevention, Vascular Complications, Diabetic Tissue Regeneration, Obesity, metabolic Syndrome, retinopathy, neuropathy and more. As you age, activating your Nrf2 is important in order to keep your cells healthy and protected from age-related disease processes. Here are three (3) ways Nrf2 can be activated. Researchers believe that ancestral people most likely made certain foods, fungi and spices a regular part of their diet due to their anti-aging, Nrf2 activation effects. Certain plant, vegetable, and fungi compounds and micronutrients have a tendency to increase Nrf2 activation. For example, the following natural compounds and sources have Nrf2 activating properties: curcumin (turmeric root), sulforaphane (broccoli), resveratrol ( peanuts, pistachios, grapes, red and white wine, blueberries and cranberries), vitamin D and the phytochemical components of garlic, tomatoes, grapes, green tea, coffee, and berries. Making these foods part of your diet can help protect your cells with Nrf2 activation. Because of the significance of Nrf2 activation in treating diseases caused by oxidative stress and inflammation, pharmaceutical and research companies are focusing resources on developing Nrf2 activation drugs. These drugs are synthetic, toxic, have side effects and carry a huge associated cost. The most advanced Nrf2 activator on the market is all natural, has no side effects and no known drug interactions. To learn more about this medical breakthrough Nrf2 activator CLICK HERE!. If you enjoyed this post, Nrf2 And diabetes: What Your Doctor Won’t Tell You, please retweet, share and/or comment below!